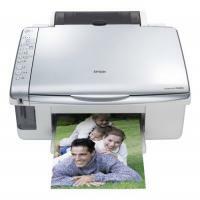 The Epson Stylus Dx4800 printer is a versatile printer that makes a useful addition to small workplaces and homes. The all-in-one printer falls well within a comfortable price range. With the Epson Stylus Dx4800 ink cartridges, photo prints of good quality are a given. The company has designed this printer keeping in mind the requirements of their consumers. The stylish steel gray Epson Stylus Dx4800 comes in a curvaceous design. Its width, depth, and height are 430 X 354 X 181 mm respectively. This sleek printer weighs about 6 kgs thus making it easy to handle if required. To start with, the printer is compatible with all Windows-based devices and iOS devices as well. You can connect it to your system using a USB. It also has a memory card slot. On the top, it has a 1200 dpi flatbed scanner. The device has a comprehensive control panel with a stick-on label giving details about the controls of the printer. If you use a camera then you have the ease to print directly from your camera using PictBridge. The company claims that the prints done using the durabrite Epson Stylus Dx4800 ink cartridges do not fade over time. Though the print speed is low, the print quality is good. The printing resolution that it offers is 5760 X 1440 dpi. It has a print speed of 2.9 ppm for black only and when you print graphic and text it prints at a speed of 1.3 ppm. But you have an option for borderless printing. The printer has an interesting feature that is helpful during cartridge change. When the ink cartridge has exhausted and has to be replaced, the head carrier moves to the location of the cartridge that requires change. The printer also offers easy standalone copying option. The multifunctional printer is designed to fulfill your basic printing requirements. The slow printing speed of the device is a major drawback. The lack of an LCD screen and absence of WiFi connectivity adds on to it. However, the print quality and affordability of printing, scanning, and copying requirements are pretty good for a device at the given price. How to perform printhead cleaning to improve the print quality of your Epson Stylus Dx4800 printer? If your printouts are unexpectedly light or faint, or you notice dark bands across the pages. This might be a result of old dried out Epson Stylus Dx4800 ink cartridges or clogged printheads. Thus, you may need to replace the old cartridges or clean the print heads so that the printer can deliver good quality prints again. Follow the steps below to see if the printhead needs cleaning. Print head cleaning uses ink, so clean it only if the nozzle check indicates that it needs cleaning. Q. I’m using Epson Stylus Dx4800 ink cartridges for my Epson Stylus printer. How will I know that these ink cartridges need replacement? Also, suggest me the replacement ink cartridges. Q. Do you offer coloured Epson Stylus Dx4800 ink cartridges at your site? A. Yes, we offer both coloured and black ink cartridges. Q. I would like to know about the compatibility of operating systems and the USB connectivity required for this printer? A. The printer is compatible with all Windows-based devices and iOS-based devices. You can easily connect this printer to your system using USB. Q. I have been advised to purchase Epson Stylus Dx4800 printer for my business use. What additional features does the printer include? Q. Why is it necessary to clean the Epson Stylus Dx4800 printer? A. During the printing process, paper, toner, and dust particles might get accumulate inside the printer. Over time, this can cause print quality problems, such as toner specks or smearing, and paper jams. To avoid such type of problems, you must clean the cartridge area and the printer media path regularly. Q. I’d like to know exactly how many pages does each of the Epson Stylus Dx4800 ink cartridges (T0615) prints. Thanks. A. Each ink cartridge prints 250 pages. Q. If I’m not satisfied with my purchase of Epson Stylus Dx4800 ink cartridges, will it qualify for a money-back guarantee from the seller? A. Yes, most sellers offer a no-quibble money back guarantee on their products including on ink cartridges. They also offer a host of additional sops such as free shipping, 12-year guarantee, easy returns and more if the customer is not satisfied. Q. I would like to know if I need to do anything manually with regards to the chip while installing Epson Stylus Dx4800 ink cartridges. A. No, you don’t have to worry about doing anything while installing these ink cartridges. The ink cartridges are already fitted with a chip so you can install them directly into the printer. Q. If compatible ink cartridges are supposed to print as well as the original ones, then how are they priced cheaper? Do professionals really use compatible ink cartridges as much as the manufacturers claim? A. Compatible cartridges, whether they use ink or toner, are prepared from recycled material. Not all the components they are composed of are brand new. That cuts down costs considerably. Besides, compatible ink cartridges are put through strict quality checks after they are manufactured, so they can print as well as the original ink cartridges. Q. For how long can I keep new Epson Stylus Dx4800 ink cartridges out of their packaging at the time of installation? Do they malfunction if they are kept outside? A. You need to install the opened ink cartridges immediately after they have been taken out of their pack. Doing so prevents them from drying up and losing their effectiveness. It is advisable to keep the replacement cartridges handy before beginning their installation so things get done promptly.